Shortcuts in Windows are quick ways to launch applications or open documents. Windows 7 introduces a new and quick shortcut to open up applications or documents. This new shortcut concept is called as JumpList in Windows 7. 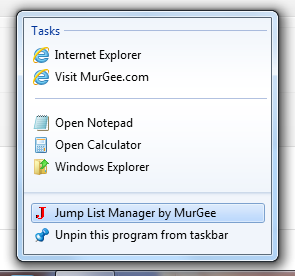 The JumpList Shortcuts are displayed in a menu when you right click on an application icon in taskbar. Every Application is responsible to create and manage it’s JumpList. In case you have not seen the JumpList, move your mouse cursor to any application’s icon in TaskBar and right click on it. You will notice a menu which is just like traditional menu displaying various tasks, recently used documents and even frequent document file names are displayed in application’s JumpList. In case you would like to create your own JumpList to launch various applications or documents, you must have a look at JumpList Software. Unlike desktop shortcuts, this new way of opening applications, documents or even websites do not require to show desktop or minimize applications. The JumpList Software will work on Windows 7, Windows 8 onwards operating systems of Microsoft Windows.